Qatar’s Nasser Saleh Al-Attiyah and French co-driver Matthieu Baumel overcame hefty penalties that were added to their overall time to regain the outright lead with the fastest time on the 340.54km selective section of the Qatar Cross-Country Rally on Friday. The Toyota Hilux driver started the day with a stage lead of 16:07 minutes, but incurred 15 minutes of time penalties for missing a waypoint and a further two for a speeding violation. He came under fierce pressure early in the day’s special in the north of Qatar from closest Polish rival Jakub Przygonski in an X-raid Mini, but the former enduro rider ceded time from then on and now trails the Qatari by 7:26 mins. The day’s 340.54km selective section began to the north of Losail and passed around the northern extremities of the country before cutting across the uppermost deserts to run down the western coast to finish off the Al-Kharsaah Road, west of Doha. "We did a good job today after the road penalties and we push for the last 180km," Al Attiyah said after the stage. "We feel a piece of the right rear tyre coming off because of the heat, but we decided to continue. I am quite happy to have a good stage. 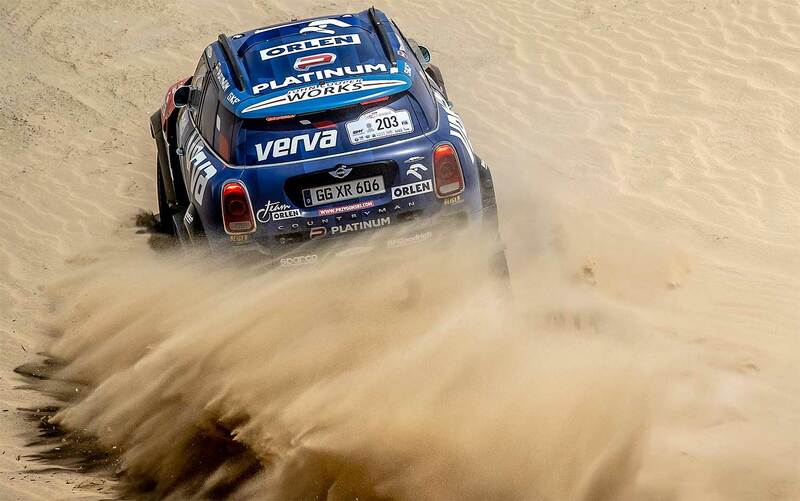 Tomorrow we need to make a good time in the dunes at the start of the stage." X-Raid´s Jakub Przygonski commented: "It is a tough race with the navigation and a lot can happen. We know there are tough penalties for missing waypoints. Today was quite a tough stage. We had to be really focused. In the beginning we were quite fast and, in the middle, we were too slow. We lose some time with the navigation and then we pushed for the last 100km and gained some time. Still the fight is on. One small mistake in navigation and you can lose all the time. The dunes may be an advantage to Nasser. He knows the area and they are not big dunes. He may win some time there but, at least, we will have his line." 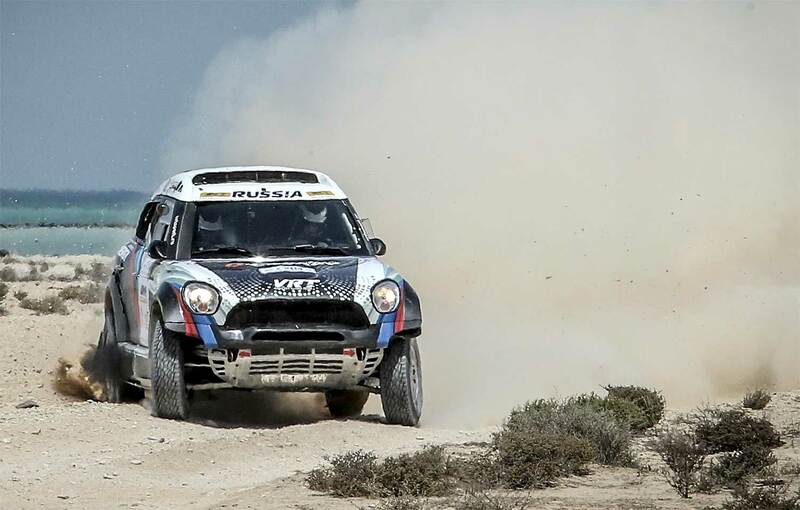 Vladimir Vasilyev benefited from time penalties for both Yasir Seaidan and Aron Domzala, but that did not detract from an excellent stage performance by the Russian in his private G-Energy X-Raid Mini. He carded the third quickest time to move up to a similar position in the overall rankings. 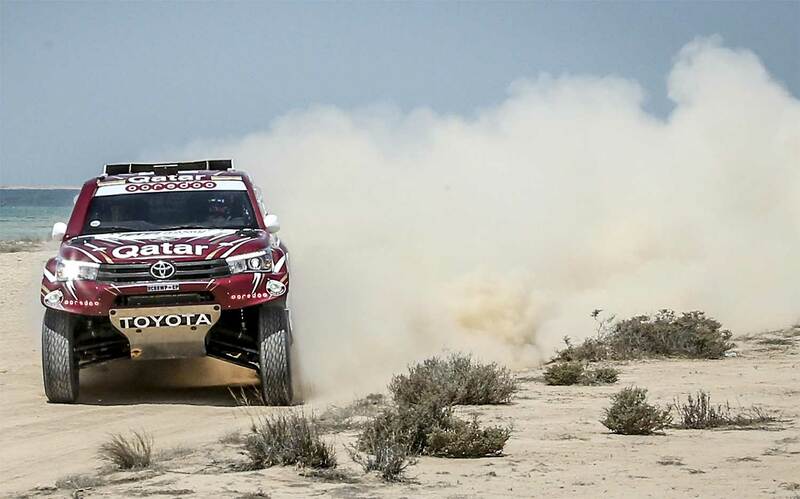 Despite his own time penalties, Saudi Arabia’s Yasir Seaidan was in an excellent pace for much of the day’s stage in his Overdrive Toyota and was running a mere two seconds behind Al-Attiyah at one point. He lost some time late on but the fourth quickest time enabled the defending FIA T2 World Champion to hold fifth position. Poland’s Aron Domzala held fourth in the third of the Toyotas. FIA World Cup leader Martin Prokop completed the day with the sixth quickest time to maintain a similar place in the overall standings. He remains on track for a vital haul of championship points. Dutchman Erik van Loon suffered a gentle roll shortly after the fourth passage control and lost the chance of a top-five stage finish. He will incur hefty penalties before the restart on Saturday after waiting for a fellow competitor to tow the Toyota back on to its wheels. 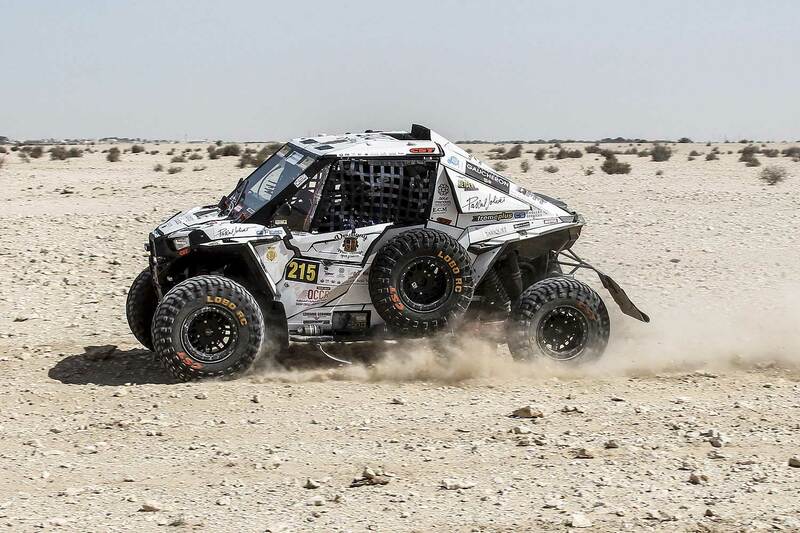 Qatar’s Adel Abdulla stayed out of trouble over the treacherous terrain and maintained a safe pace to extend his T2 category lead in a Nissan Patrol Y62 backed by the QMMF and Ooredoo. All his rivals suffered long delays in the desert. In the SSV, Frenchman Claude Fournier extended his advantage in T3 after further delays for Spain’s José Luis Pena Campo, Italy’s Michele Cinotto and Spaniard Santiago Navarro. In the quads, Russian quad rider Alexsandr Maksimov extended his advantage over Dutch rival Kees Koolen to 40:19 minutes after a measured run at the front of the entire field. Polish Orlen Team rider Maciej Giemza safely negotiated the special after falling behind the leading cars and the top quad to remain on course for maximum FIM World Cup points.